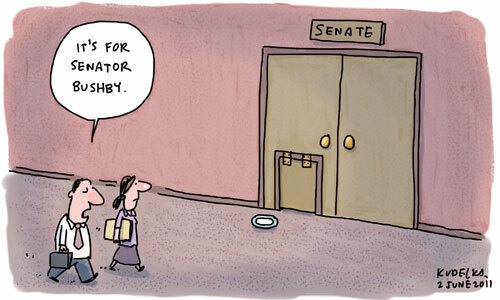 David Bushby, Senator from my home state of Tasmania, has brought shame upon himself and his constituentsÂ by meowing at Penny Wong during a Senate estimates hearing yesterday. The odd epithet is nothing new in parliament and Bushby’s effort has been compared to Julia’s “mincing poodle” as an example of how this is in fact right and proper conduct for our elected representatives. I think we can all agree that there’s nothing wrong with a good insult, however while Julia had obviously put a bit of thought into hers, the truly insulting thingÂ about David’s effort was the sheer wretched banality of it. Senator Wong was well within her rights to be livid. Estimates is one of Australia’s prime gigs for casting aspersions and while nobody’s expecting Oscar Wilde, as a Federal minister, Penny should be able to expect something a little better than a poorly delivered cat impersonation. Honestly David, in the unlikely event you’re ever allowed to stick your bonce above the parapet again, do Tassie proud and roar like a lion, don’t meow like a cat. Woeful effort. I give it no stars.